The collapse of the Vick empire. A deed of trust is essentially an agreement between a lender and a borrower to give legal title to a property to a neutral third party who will serve as a trustee. The trustee holds the property until the borrower pays off the debt owed to the lender. During the period of repayment, the borrower keeps the actual or equitable title to the property and generally maintains full responsibility for the premises. The trustee, however, holds the legal title to the property and is empowered to sell the property to satisfy the debt if the borrower defaults. Once the sale is complete, the trustee will distribute the proceeds between the borrower and the lender. The lender gets whatever funds are required to satisfy the debt, and the borrower receives anything in excess of that amount. Tract 1 — the house and lot at 310 [North] Pender Street. Tract 2 — the house and lot at 313 [North] Pender Street. Tract 2-A — the houses and lots at 401, 403, 407 and 409 Viola Street. Tract 5-A — the house and lot at 714 East Viola Street. Tract 5-C — the houses and an empty lot at 711, 713 and 717 East Green Street. Tract 5-D — the house and lot at 716 East Green Street. Tract 5-E — the house and lot at 703 East Green Street. Tract 5-F — the house and lot at 709 East Green Street. Tract 5-G — the houses and lots at 606, 608, 610, 612 and 614 East Vance Street. Tract 5-H — the houses and lots at 630 and 632 East Vance Street. Tract 5-I — the house and lot at 620 East Vance Street. Tract 5-J — the house and lot at 624 East Vance Street. Tract 5-K — the house and lot at 628 East Vance Street. Tract 5-L — the houses and lots at 617 and 619 East Viola Street. Tract 5-M — the houses and lots at 705 and 707 East Viola Street. Tract 5-N — the house and lot at 623 Darden Alley [now Lane]. Tract 6 — the houses and lots at 701 and 703 East Vance Street. 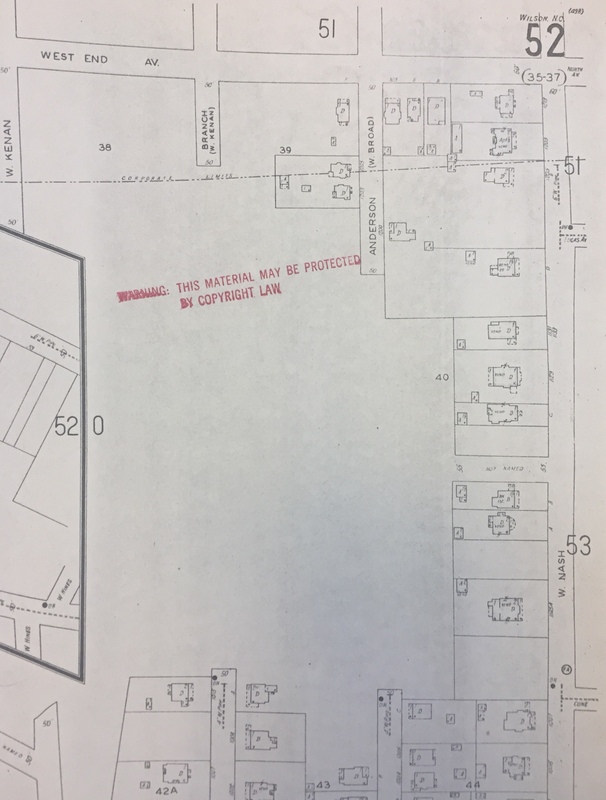 Tract 7 — a 5820 square-foot lot on Viola Street. Tract 8 — the house and lot at 508 East Green Street. Tract 9 — the houses and lots at 509 and 511 [East] Green Street. Tract 10 — the houses and lots at 503 and 505 [East] Green Street. Tract 12 — the houses and lots at 529, 531 and 533 East Nash Street. Tract 13 — the houses and lots at 543, 545, 547 and 549 East Nash Street. Tract 25-A — the buildings and lots at 535, 537 and 539 East Nash Street. Tract 25-B — the house and lot at 526 Smith Street. Tract 25-C — the house and lot at 522 Smith Street. Tract 25-D — the house and lot at 516 Smith Street. Tract 25-E — the houses and lots at 523 and 525 Smith Street. Tract 25-F — the houses and lots at 517 and 519 Smith Street. Tract 14 — the house and lot at 518 East Nash Street. Tract 15 — a 53′ by 153′ lot on Church Alley [now Street]. Tract 17 — the houses and lots at 402 and 404 Vick’s Alley [now Parker Lane]. Tract 18 — the house and lot at 503 South Spring [now Lodge] Street. 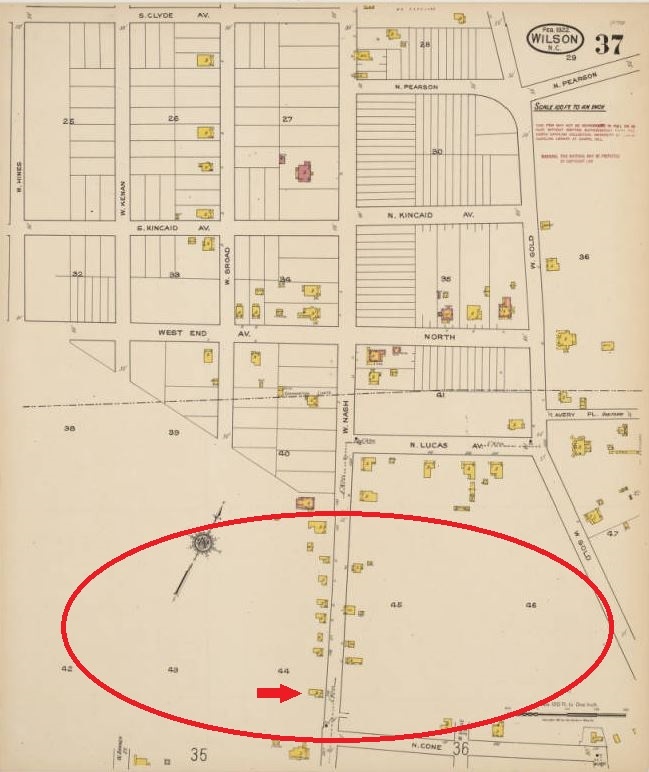 Tract 19 — a 7200 square-foot lot adjoining Louis Townsend, near Spring Street [now Lodge]. Tract 20 — the houses and lots at 406 and 408 Vick’s Alley [now Parker Lane]. Tract 21 — the houses and lots at 403, 405, 407 and 409 Vick’s Alley [now Parker Lane]. Tract 23 — the houses and lots at 206 and 208 South Manchester Street. Tract 26-A — the houses and lots at 810 and 812 Elvie [formerly, Elliott] Street. Tract 26-B — the house and lot at 1002 Elvie Street. Tract 26-C — the houses and lots at 801 and 803 Elvie Street. Tract 26-D — the house and lot at 811 Elvie Street. Tract 26-E — the house and lot at 908 Elvie Street. Tract 31-A — the houses and lots at 903 and 907 Mercer Street. Tract 31-B — the house and lot at 915 Mercer Street. Tract 32 — a lot on Sugg[s] Street. Tract 33 — the house and lot at 700 Suggs Street. Tract 34-A — the house and lot at 309 Hackney Street. Tract 34-B — the houses and lots at 305 and 307 Hackney Street. Tract 35-A — the house and lot at 617 Darden Alley [Lane]. Tract 35-B — the house and lot at 623 Darden Alley [Lane]. Tract 37 — the houses and lots at 109, 111, 113, 115, 117 and 201 East Street. Tract 38 — the houses and lots at 108 and 110 Ashe Street. Tract 39 — the houses and lots at 114, 116 and 118 East Street. Tract 40 — 40 acres in Wilson township. Tract 42 — the houses and lots at 400, 402 and 404 Hines Street. Tract 43 — the houses and lots at 500 and 502 East Vance Street. Tract 44 — the house and lot at 712 East Vance and the adjoining lot. Tract 45 — the house and lot at 603 Darden Alley [Lane]. Tract 46 — the house and lot at 504 [North] Vick Street. Tract 16 — the house and lot at 519 Church Street. Separate deeds filed the same day showed the transfer of (1) a 50-acre subdivided parcel (minus several dozen lots already sold) from trustee E.R. 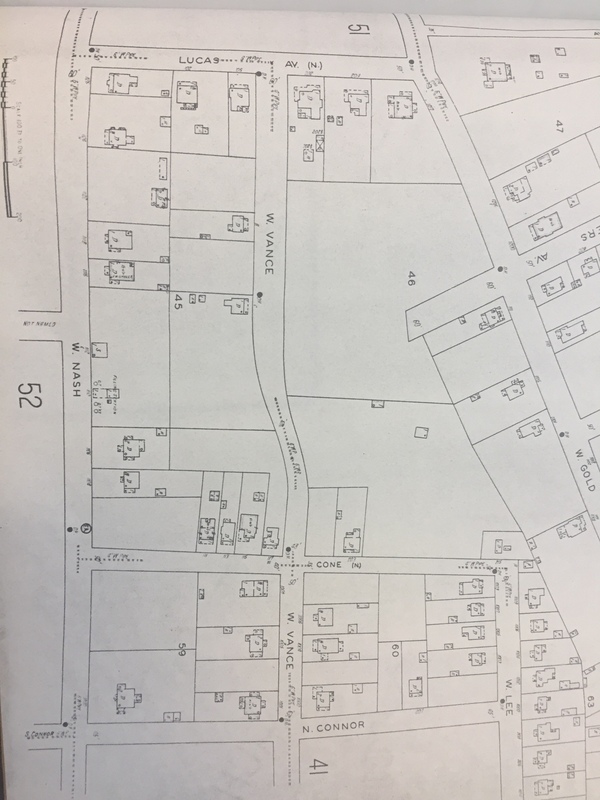 Merrick to Home Development Corporation for $3500 (Deed Book 221, page 332), and (2) 7 lots on Suggs, Vick, Church and Viola Streets from trustee R.L. McDougald to Home Development Corporation for $6000 (Deed Book 221, page 331). Both transactions involved land the Vicks had borrowed against. Marked with red asterisks, this roughly six-block area shows the locations of 34 properties held in trust by Merchants and Farmers Bank and sold on 4 April 1935. Many were small shotgun houses built for rental to working-class families. 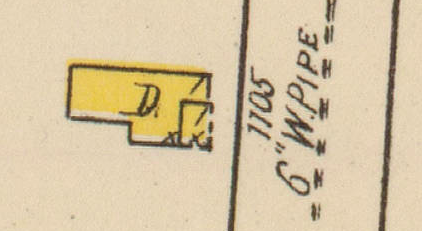 Excerpt from page 32 of the 1922 Sanborn fire insurance map of Wilson, N.C. In October 1900, Cain and Margaret Barnes Artis sold a large lot in southeast Wilson to Mount Hebron Lodge No. 42, Prince Hall Masons. This Deed made this the 8th day of October, 1900 by Cain Artis and wife Margaret Artis, the parties of the first part to Austin J. Lindsey, Worshipful Master, Lee A. Moore, Senior Warden and John Barnes, Junior Warden, acting officers of Mount Hebron Lodge No. 42 F & A Mason and their successors in office, the parties of the second part, all of said parties being of the aforesaid County and State. Beginning at a pine stump on road (commonly called path) in Charley Battle’s corner, thence with his line N. 87. 35 E 264 feet to a stake, thence S. 36. 15 E. with Cain Artiss line 172 1/2 feet to a stake, thence S. 53. 45 W. 230 feet with Cain Artis line to a stake on the road or path thence along said path N. 36. 15 W 308 feet to the first station, containing 57,900 square feet. To Have and to hold the aforesaid lot of land to them the said trustees and their successors in office in fee simple forever. And the said parties of the first part covenant to and with the said parties of the second part and their successors in office that they will warrant and defend the title to the said land against the lawful claim or claims of any and all persons whatsoever. On 14 December 1876, Cain Artice, 23, of Wayne County, married Ann Thompson, 24, of Wilson in Wilson County. T. Felton, Jno. Newsome and Louisa Thompson were witnesses. In the 1880 census of Nahunta township, Wayne County: farmer Cain Artis, 25; wife Annie, 25; and children Ivey C., 2, and Appie, 1. 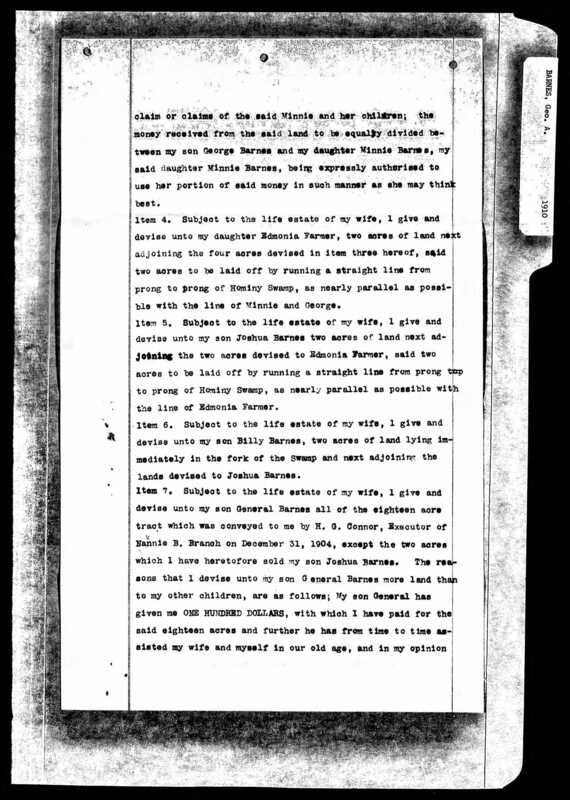 On 11 November 1888, Cain Artis, 35, of Wayne County, son of Adam Artis and Winny Artis, married Margaret Barnes, 38, of Wilson, daughter of Sherard Edmundson, at Margaret Barnes’ house in Wilson. Primitive Baptist minister P.D. Gold performed the service in the presence of H.C. Phillips, Henrietta Clarke and Mary J. Davis. Charles Battle applied for the license. In the 1900 census of Wilson township, Wilson County: farmer Margaret Artis, 50; daughters Appie, 21, and Mary F., 20; and boarder William Watson, 22. Margaret was described as married; Cain is not found in the 1900 census. Appie was his daughter, and Margaret’s step-daughter. In the 1912 Hill’s Wilson, N.C., city directory: Artis Cain (Oates & A) h E Nash extd bey limits. Also: Oates & Artis (Wiley Oates – Cain Artis) grocers 601 E Nash. Appie Artis died 28 May 1916 in Wilson. Per her death certificate, she was born August 1879 in Wayne County to Cain Artis and Annie Thompson of Wayne County; was single; worked as a laborer; and died of pulmonary tuberculosis. Cain Artis, Wilson, was informant. Cain Artis died 23 March 1917 in Wilson township, also of pulmonary tuberculosis. Per his death certificate, he was born March 1851 in Wayne County to Adam T. Artis and Winnie Coley; was married; and was a farmer. W.M. Coley of Wilson was informant. 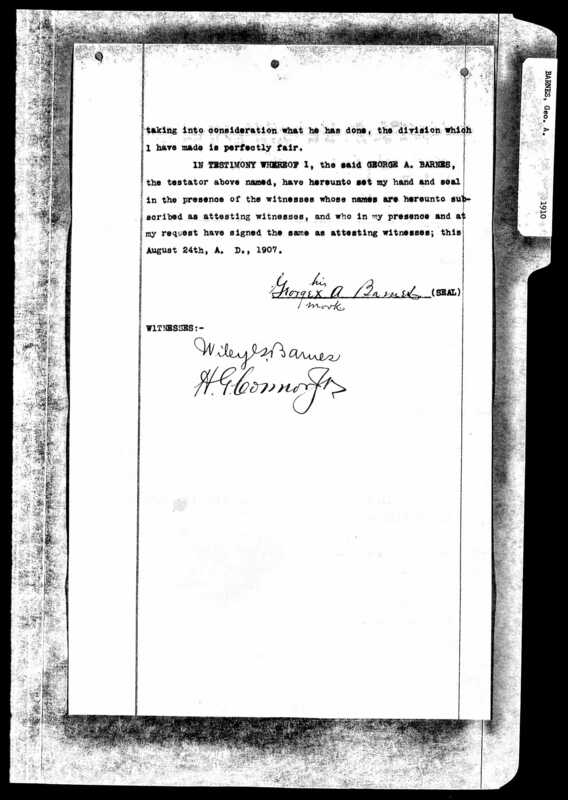 Margaret Artis’ will entered probate in January 1919. 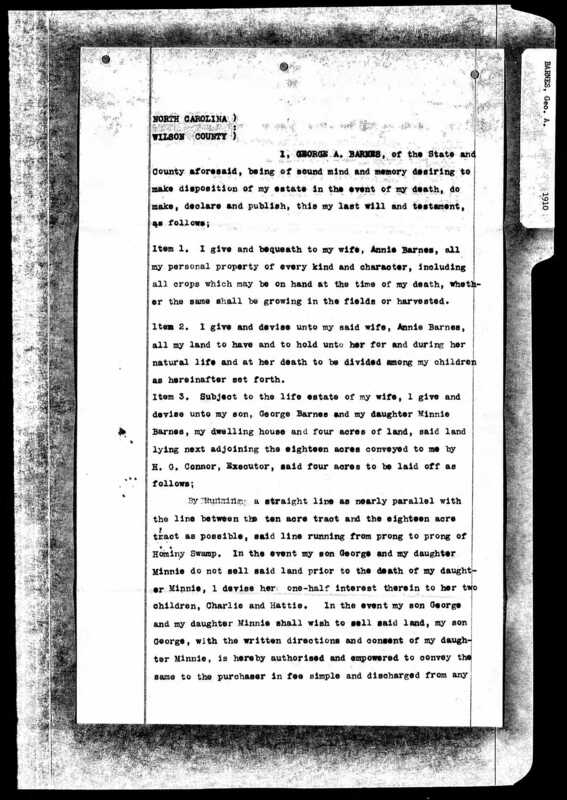 Though the document is dated 1909, it seems actually to have been executed days before she died in 1919. Her sole heir is her daughter Sarah Barnes Barnes. She makes no mention of husband Cain Artis, and the 44 acres she bequeathed seems to have been that she had jointly owned or inherited from him. 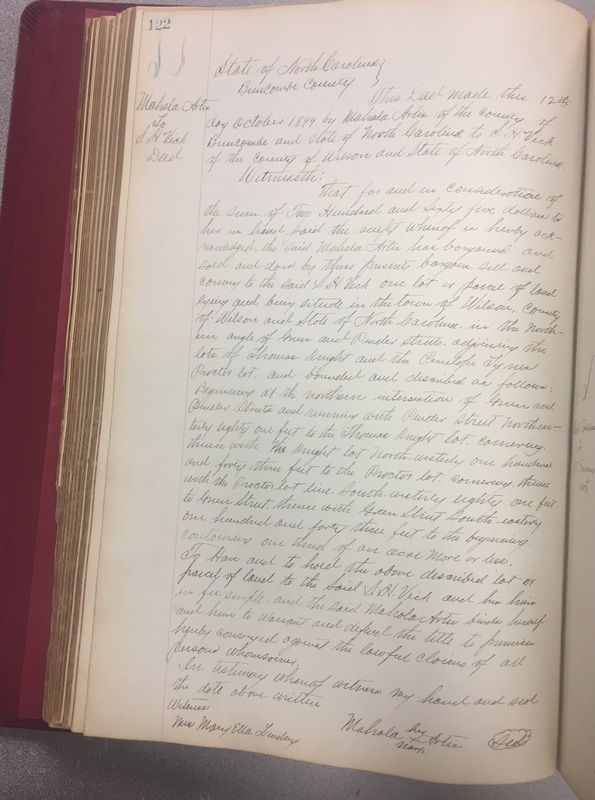 Deed book 55, page 434, Register of Deeds Office, Wilson County Courthouse.